In this installment, I answer a number of questions on various topics: Podcasts, smart playlists, streaming audio, and what happens to your iTunes Store content when you’re gone. Q: I would like to sync my entire iTunes Library to iTunes Match, but this doesn’t seem to be possible at this time. Unless I am mistaken, iTunes Match only syncs music, not podcasts, videos or iTunes U content. Is this true? Unfortunately, yes. iTunes Match only works with music, so your iTunes U content and videos won’t match. As for podcasts, ideally, iTunes Match should allow you to sync not only your podcast subscriptions, but also which episodes you have listened to and where you left off if you haven’t finished listening to an episode. Apple’s own Podcasts app ( ), recently released for iOS, doesn’t do any of this. 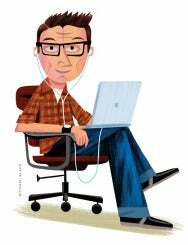 There are a number of third-party apps that you can use to manage podcasts that you might find superior to iTunes and to Apple’s iOS apps. In terms of video, most movies and TV shows you’ve purchased from the iTunes Store are available to watch from your other computers and iOS devices, regardless of whether you’ve subscribed to iTunes Match (part of Apple’s iTunes in the Cloud feature in supported countries). This doesn’t apply to any videos you’ve made yourself or gotten from other sources, however. Q: I’d like to create a smart playlist that has a negative search condition: All my 5-star favorites where genre is not equal Holiday. This should be possible, right?. Yes, and it’s pretty easy. You can use multiple conditions in a smart playlist, and you can use negatives as well. Create a new smart playlist (File -> New Smart Playlist), and use the following conditions: Rating Is ★★★★★ and Genre Is Not Holiday. Make sure the pop-up menu at the top of your smart playlist is set to Match All Of The Following Rules. With this smart playlist, you can listen to all your favorite tunes, but leave out those holiday songs that you don't want to hear in summer. Q: What happens to my iTunes account and all my iTunes content when I die? Can my daughters “inherit” all the songs and other content that I’ve purchased? They’d own all those items if they were “physical” products (CDs, DVDs), so shouldn’t they be able to own the digital items as well? This is a very good question, and I don’t think Apple or any other company has prepared for this. If no one else has credentials for your account, I don’t know if Apple would provide a way for your next of kin to access the account. The only solution I can think of is to make sure that your daughters have your iTunes Store username and password. With these, they will be able to continue to access all of the content that you purchased. Q: I would like to play same music on all the floors in my home. I have set up iTunes on all computers and they share same music library. However, I am not sure how to stream the same music to all the computers in different rooms. Is there a way to do this without going to each and starting manually? 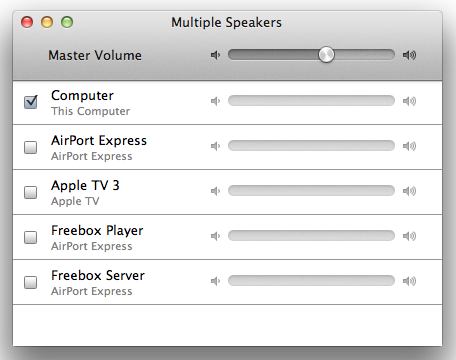 Choose one or several AirPlay-compatible devices from this window. Unfortunately, you can’t stream music from one computer playing iTunes to other computers. You can, however, use AirPlay in iTunes to stream music to different devices. You can stream to an Apple TV, to an AirPort Express to which you connect speakers, and to some third-party devices that are compatible with AirPlay. To do so, click on the AirPlay icon at the bottom-right of the iTunes window. Choose Multiple Speakers from the bottom of the list. Check the box next to each AirPlay-compatible device you want to use, then close the window. When you play from iTunes on the computer where you have set up AirPlay, it will stream music to all of the AirPlay-compatible devices you have selected. Another option for streaming audio to multiple locations in your house is Rogue Amoeba’s $25 Airfoil. Q: I know there is plenty of free content on the iTunes Store. Is there anywhere I can find all this free content in one place? 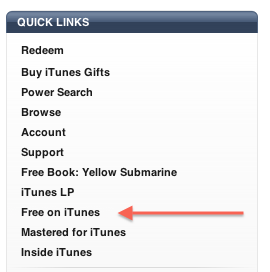 The Free On iTunes link takes you to a page with some of the most recent free content available from the iTunes Store. You can find some of it. 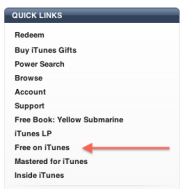 There is a link on the main page of the iTunes Store in the Quick Links section. Click on Free On iTunes and you’ll see a list of some of the “current” free content on the iTunes Store. This isn’t an exhaustive list, however. It doesn’t go back very far, but if you check it regularly you’ll be able to find what free content has been added recently. Note that this list doesn’t include all of the free apps on the iTunes Store. There are tens of thousands of them, so you certainly don’t want to wade through a list that long. It looks like the free apps in this list are new, recently updated, or the ones that Apple wants to highlight.